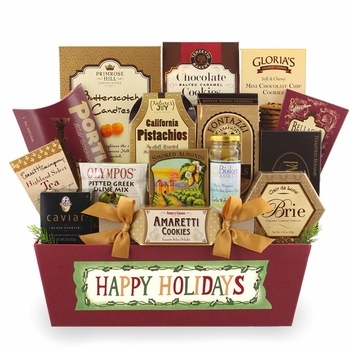 At Bisket Baskets, we pride ourselves in using high quality ingredients and products in all of our gift baskets. Unfortunately, not all gift baskets are stocked full of fresh goodies and sturdy dishware. Gift baskets are fun to give during the holiday season, but there are a few things you should keep in mind when buying for someone. First, make sure the receiver doesn’t have any food allergies. If your co-worker is allergic to nuts you should avoid gifts that contain peanuts, nut butters, etc. even if it’s not the base of the gift. Some people are much more sensitive than others and can have a reaction just from touching the product. The same goes for people with special diets. We highly doubt your vegan cousin would appreciate receiving a holiday gift basket filled with meat and cheese. Also keep in mind the age in which you’re buying for. A lot of gift baskets come with small trinkets or potentially dangerous kitchenware that wouldn’t fare well in the hands of a young child. We make sure to list the contents of all our gift baskets so you never have to worry about what’s inside. Have you ever received a not-so-great gift basket? Share your stories with us and visit BisketBaskets.com for all of your quality holiday gift basket needs!